Hello everyone, this blog is where I'll be making forecast for storms when they develop in the Atlantic in the 07 season. This was inspired by the net-weather forecasters blogs and I thought to myself why can I not do one on hurricanes, something I do know something about, and hence why this blog page is here right now. We've already had subtropical storm Andrea which developed from a cold cored system that moved off from the NE then dug down SSE as a strong high pressure cell developed over Canada at 1036mbs helping to give a tight pressure gradient and allowing gusts of 55-70kts as well as giving forcing for the system to develop further. At the time it was a baroclinic low (cold cored) however as it moved over the Gulf stream, a area of flowing water which is also warmer the system started to develop shallow convection as the lapse rates grew between the surface waters and the cooler atmosphere above. As this occurs instability increases and the storms can become larger and stronger which drives pressure down eventually. 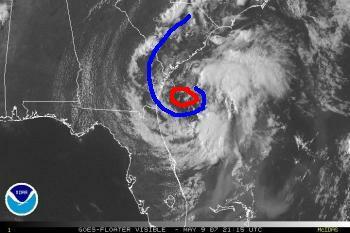 2: Convection is usually displaced a little away from the center of the low level circulation. This also means that the system has a larger wind-field, which is a tell-tale sign of a subtropical storm. The circulation was present based on IR and clearly the circulation is evident with the center somewhere in the red in the above visible image. The convection is displaced to the east of the center and clearly there is no frontal system visible which means the system fits into the criteria of subtropical cyclone and as winds had already been upped because of the tight gradient the previous days it meant it was upgraded to Andrea right away. As the gradient slackened and as it moved off the gulf stream it weakened with nothing to sustain it. While I didn't make a blog forecast on this system my call of a subtropical storm possibly and also 35-45mph max sustained winds looked a decent enough call and also made the right call in dismissing the more aggressive models which progged a hurricane. Next Blog should be sometime early next week, where we'll be looking at other early season storms, of course unless another system starts to develop!